Image courtesy of the City of Canada Bay Heritage Society. The City of Canada Bay Heritage Society invite you to join them for the last event of 2018 which will be a screening of the film The Menin Gate Lions – a poignant documentary telling the story of the Lions return to Ypres on Saturday 3 November. 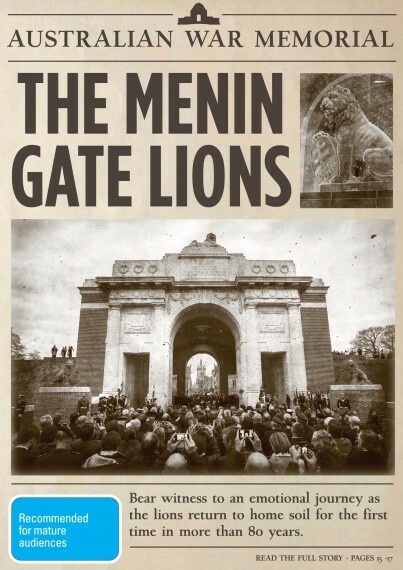 The Lions had been at the Menin Gate, guarding the entrance to Ypres, during the period of the First World War, when literally thousands of soldiers marched through the gate on their way to the battlefields. At the end of the war the lions, broken and scarred, were recovered from the rubble and, in 1936, the Burgomaster of Ypres presented them to the Australian government as a token of friendship and an acknowledgement of Australia’s sacrifice in the region during the war. An initiative between the Belgian, Flemish, and Australian governments saw the lions temporarily returned to the Menin Gate between April and November 2017 to mark the centenary of one of the most costly campaigns of the First World War, the Third Battle of Ypres, often known simply as “Passchendaele”. When: Saturday 3 November, 1.30pm for 2.00pm sharp. Cost: Free. Donations welcomed. Light refreshments are included.